When National Peace Council (NPC) Secretary, Charles Mackie, went on a speaking tour in 1912 he left Rose Atkinson and Ellen Howell in charge of the NPC office. Several letters sent during this period to members of Parliament, trades unions and churches seeking their support for the repeal of the Defence Act were signed by Rose Atkinson. Rose Atkinson also wrote letters to the newspaper during this time, describing herself as a 'strong opponent of compulsory military training'. The Evening Post criticised a deputation of women to Arthur Myers, the Minister of Defence, who intended to confront him on the issue of compulsory military training. Rose Atkinson responded with a spirited defence of the women who, she said, had not been allowed to proceed for a few minutes before they were 'impatiently interrupted by the minister, who said that he knew what they were going to say, that he had had no lunch, and that he had to catch a train'. Rose Atkinson, born Rose Claridge Bell in Manchester was married to Harry Albert Atkinson at Chorlton upon Medlock, Lancashire on 30 September 1893. Harry Atkinson came from a leading Taranaki family. His uncle, also Harry Albert Atkinson had been a minister for colonial defence and was to become premier of New Zealand. As a young man in Wellington Harry Atkinson had been exposed to radical ideas and when he went to England in 1890 he became secretary for a Labour Church in Manchester, worked for better wages for some of the lowest paid workers in the area, and was a founding member of the Manchester and Salford Independent Labour Party. When the young Harry Atkinson returned to New Zealand in 1893 with his bride he was a 'confirmed socialist'. Once settled in Christchurch Harry Atkinson got work as a fitter at the Addington Railway Workshops where he met and became a firm friend of Jack McCullough, a leading trade unionist. 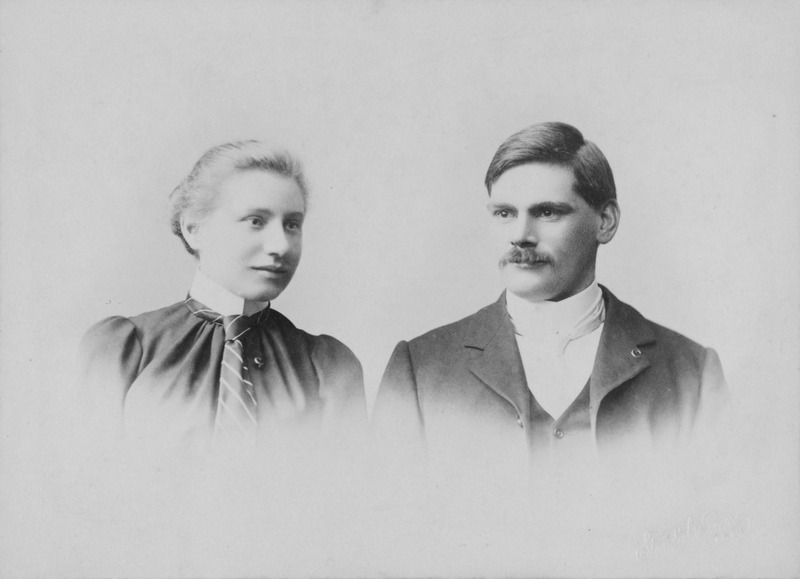 Harry and Rose Atkinson were active in the Progressive Liberal Association, one of several radical groups in Christchurch at the time, and the prohibition movement. Rose Atkinson joined the Canterbury Women's Institute (CWI) and the Women's Christian Temperance Union (WCTU), which Harry said later, 'engaged a great deal of her time'. She was on the Committee of the CWI in 1897, and again from 1901 – 1906 and served as President of the CWI from 1907 to 1908. Harry Atkinson was later to say that he and Rose became part of a 'very vigorous set' in Christchurch, associated with three groups: the Progressive Liberal Association, 'Our Father's Church' and the first Canterbury Fabian Society which began in 1896. 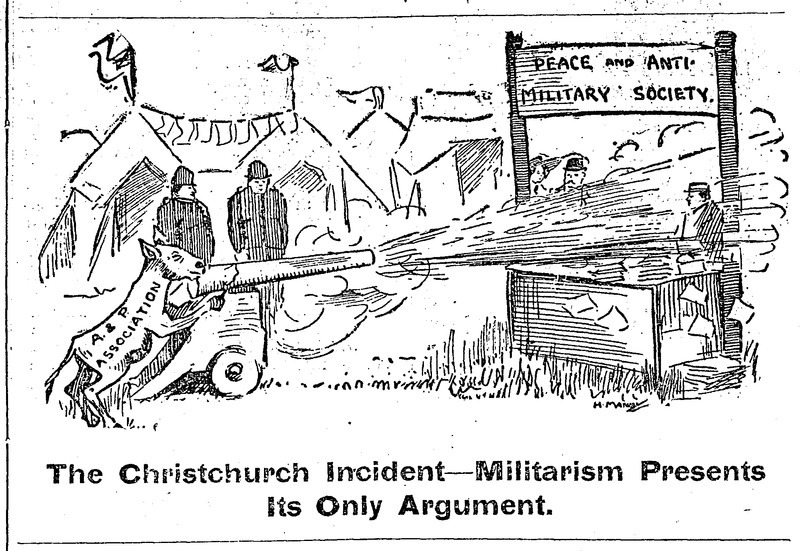 In looking at the activities of Rose and her husband Harry Atkinson we see the interconnectedness of the radical groups in Christchurch. A family occasion at the McCombs' home. 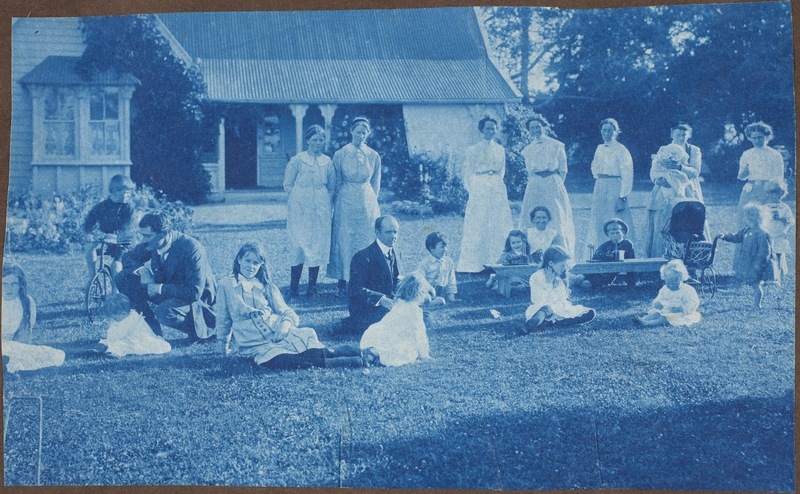 James McCombs is seated centre, on lawn. His wife, Elizabeth, is standing fourth frrom left. In 1896 Harry Atkinson formed the Socialist Church in Christchurch, based on the British model – the first organisation in New Zealand to call itself socialist. Membership of the church was small but included many of the same people the Atkinsons already knew through the Progressive Liberal Association: James and Elizabeth McCombs, Stella and Christina Henderson (sisters of Elizabeth McCombs), Louisa Blake, also an active member of the Canterbury Women's Institute, and William Ensom. The church opposed the South African War which caused division and defections and it ceased to function in 1905. James Taylor argues that the Atkinsons were part of a tight socialist sub-culture in Christchurch during the time that the Socialist Church was active. He goes on to say that both Harry and Rose, 'acted as conduits, mentors, and friends to a number of like-minded socialist individuals' and both developed a wide circle of associates and long-lasting friendships. Rose and Harry Atkinson were also members of the Christchurch branch of the Socialist Party that formed in 1902 and in 1908 Harry Atkinson revived the Christchurch Fabian Society which remained active until about 1916. The Fabian Society spent a lot of its funds on importing radical literature from Britain, with the Atkinson home in Carlton Mill Road being the main storehouse for this literature. From 1909 the Atkinsons were involved in the anti-militarist movement and the National Peace Council alongside many of the people they already knew well. As well as assisting in the National Peace Council office Rose Atkinson attended court cases where young objectors to Compulsory Military Training were being heard and she also visited them in Lyttelton Gaol and on Ripapa Island. This cartoon from the Maoriland Worker depicts the incident in November 1911 when Harry Atkinson was expelled from the A & P Show for giving out 'inflammatory and illegal' material. In their later years Rose and Harry Atkinson continued to work for pacifism, anti-militarism and internationalism as members of the League of Nations Union, the No More War Movement, and the Peace Pledge Union. Rose Atkinson died in June 1955 thus bringing to an end a marriage that had lasted more than 50 years. Her husband died the following year. Rose Atkinson to James Allen, Minister of Defence, 16 July 1912, Mackie Papers, Series 32,Box 3, Folder 14, Canterbury Museum, Christchurch. 'Fair Play for the Conscientious Objector', Press, 4 April 1914, p.12. 'The Women's Deputation', Evening Post, 20 May 1912, p.3. Herbert Roth, 'In Memoriam: Harry Albert Atkinson', Here and Now, June 1956, pp.18-20. James Taylor, “'To me, Socialism is not a set of dogmas but a living principle': Harry Atkinson and the Christchurch Socialist Church, 1890 – 1905” (MA Thesis, Victoria University of Wellington, 2010), p.81. White Ribbon, February 1897, p.4; March 1901, p.3; ‘Notes and Memoranda’, Press, 19 March 1902, p.8; ‘Women’s Institute Annual Meeting’, Press, 9 February 1903, p.5; White Ribbon, March 1904 p.3; Minute book of general meetings, October 1905 to May 1908, Canterbury Women’s Institute ARC1991.83 Folder 1545, Canterbury Museum, Christchurch. Taylor, “'To me, Socialism is not a set of dogmas but a living principle'”, p.82. Taylor, “'To me, Socialism is not a set of dogmas but a living principle'”, pp.144-6. Edith Searle Grossmann, 'In Cathedral Square', Otago Witness, 14 June 1900, p.64. Taylor, “'To me, Socialism is not a set of dogmas but a living principle'”, pp.151-154. Roth, 'In Memoriam: Harry Albert Atkinson', pp.18-20. Herbert Roth. 'Atkinson, Harry Albert', from the Dictionary of New Zealand Biography. Te Ara-the Encyclopedia of New Zealand, updated 4-Jun-2013. Taylor, “'To me, Socialism is not a set of dogmas but a living principle'”, p.155.